With mobile usage on the rise, having a mobile app might seem to be the obvious move to a number of eCommerce players. After all, it is no longer expensive to build an app. However, should cost be the only criteria for you to decide whether you need an app for your business or not? Though going mobile is imperative for you to grow your reach and engagement, you don’t really need a mobile app to do so. Moreover, there are a number of challenges that alleviate the need for small eCommerce players to use mobile apps. Competition has made app discovery really difficult. With over 2.6 million apps in Google Play Store, it would take something really unique to make your app stand out and get noticed. Even though you can now buy ads on app search-result pages, this would mean additional costs. Moreover, these ads do not facilitate user tracking and data sharing. Ultimately, for you to benefit from your mobile app, you will have to work very hard to get past the app discovery phase. If you are a small/medium business it will take massive effort initially to get substantial downloads. Even though your website might be getting a lot of traffic from mobile, all of these users might just not be interested in downloading your mobile app. Only loyal users who very frequently visit your site and buy from you often would think about downloading your app. Rest of the users simply won’t waste space on your mobile app. Even statistics aren’t encouraging enough. As per Quettra’s reported data, “an average app loses its entire user base in within a few months, which is why of the >1.5 million apps in the Google Play store, only a few thousand sustain meaningful traffic. As a small eCommerce business, you don’t really want to get stuck in the mobile marketing rut. So, what can you do? Enter progressive web apps! Loads Quickly: Google wants online players to offer an enhanced user experience. Speeding up and quickly loading is a prerequisite, especially on mobile. Take more than 3 seconds to load and 40% of your users will make a switch, says this eConsultancy study. This is one of the main reasons why you need to convert your mobile site into a PWA. With PWA, users’ screens immediately show content that a server can quickly load. Thereafter, the rest of the content is loaded on the mobile screens. This way the bounce rate reduces dramatically. Offers a Better Browsing Experience: Not only do PWAs load faster, they also offer a smooth browsing experience. Thanks to the offline functionality that PWAs offer. So, whether your users are in an area where there is poor internet connectivity, or they are switching from WiFi to mobile data, they can still smoothly browse your site. Eliminates App Discovery Challenge: The best part about progressive web apps – they are easily discoverable by search engines. Therefore, you don’t have to shell out a lot of money and effort in getting your website noticed. Another clear advantage: Because they are linkable, it makes it easier for you to promote them and get more visibility. Promises Increased User Engagement (AND CONVERSIONS): With features like push notifications, PWAs promise increased user engagement and conversions. Push notifications that are personalized and behaviorally automated, have proved to increase user engagement considerably. Because, PWAs work in all browsers and support browser notifications, together they offer a seamless user experience. With push enabled for your PWA, you can target your customers on all devices and every browser, to fetch higher engagement and conversions. Installable: Lastly, users can install your PWA on the home screen of their mobiles, making it quickly accessible. Once on their home screen, you have won users’ never ending attention and a higher recall value. 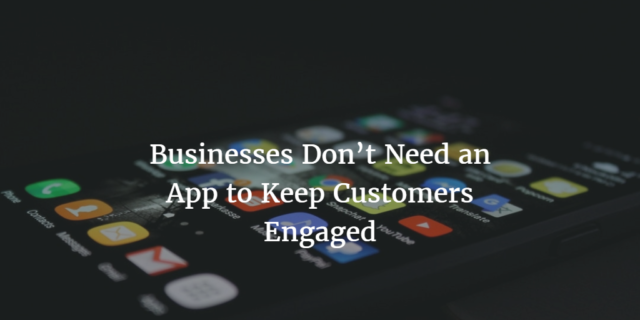 If you are a small scale eCommerce business trying to increase mobile engagement, mobile apps may not be the best answer. With app discovery and usability being the two main challenges facing your business, have you considered using PWA instead? In case you already use PWA, we’d love to know how have you benefited from comments. Umair is the founder and CEO of Wigzo. This product Ninja is passionate about anything eCommerce. Talk to him about progressive web apps, push notifications, and conversion optimization.